In addition to this permission, which gives the user ability to open a GUI, they must also have the independent permission required for each GUI you have created. Where "identifier" means the GUI name. This way of organizing GUIs through a permission-based system allows you to specify which GUI's players can open allowing for specific GUI's (for instance, a ban menu) to be off-limits for players, but allowed for moderators. If, however, you want to allow access to all GUIs you can always use the character " * " in place of "gui identifier" in the specified user's permissions. In your GUI, you may create player factor based items that can be used to display a unique item based on preset variables. You can implement these both in the configuration file for the GUI or the in-game editor that can be accessed using /cg menu. Listed in this spoiler is the different variables you can set. OP Item - Shown if the player is an operator. Permission Item - Shown if the player has the defined permission to access the item. Balance Item - Shown if the player has a certain economy balance. Default Item - Shown by default if no other conditions are met or defined. A "placeholder" is a piece of text that will change to display a configured variable in a text form. CustomGUI itself has remarkable placeholders built-in it's powerful API, however, if you are looking for an extensive database of placeholders for displaying other information CustomGUI supports PlaceholderAPI, which allows you to use many different placeholders. Listed in this spoiler are CustomGUI's built in placeholders. Click items are items which when clicked by the player from their hot bar, will open the specified GUI. These click items also perform other actions such as taking the clicked item away after use. Click items are made in the in the configuration file and highly resemble the way a GUI item can be configured. "identifier" being the name of the click item. Within the plugin, you are able to set (not create) entities that will open a GUI. Entities can be set in-game using the creation command. Once added you will be able to right-click to open the corresponding GUI as long as you have the entity permission for the corresponding GUI. CustomGUI also features a powerful sign system, for which you are able to define signs which when clicked will open a GUI. Signs can be set in-game by using the sign creation command. To allow players to be able to click the sign to open the linked GUI they must have the following permission. The plugin has a feature that allows you to transfer file types between each other. This is a useful feature when trying to keep backups or even to simply move your work. I plan on implementing converters from other menu plugins to make the change to this plugin even more seamless. At the current moment, there are the following converters which only convert menus from CustomGUI. It is recommended that you convert your GUIs to file format. To use the converter you simply enter the command in-game substituting the conversion type you would like to perform. An example of using the converter would be converting any config GUI data to separate GUI files. %player% - Displays the skull of the user viewing the GUI. username - Simply type the username of a player in place of the data value to set the skull to have a player's skin. URL - To make the skull display a skin from an URL place the URL in place of the data value. encoded texture value - Put the encoded texture value in place of the data value. What is a encoded texture value? Animated items are items that you can set which will change their name, material, or even lore every X ticks as defined in your configuration. To define animated items they must have some difference between the initial value, all animated and base values cannot be the same. If you are looking for a way to update just the item lore you can use the update placeholders toggle which will use the animation delay period to update. So for each animated items, you can specify a value for the material, name, lore, and enchants. These will be the values of the second phase of the animation. Animations are done in a looping sequence so once it displays the animated item after the delay it will revert to the original. Below are the values you can set for the animated item. This plugin has a wide range of commands that can be used to open GUI's, or even perform important functions like reloading the plugin. 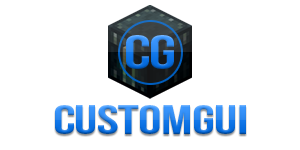 You can either use /customgui or its alias /cg for all the following commands. In CustomGUI, there is support for multiple economy plugins to make creating things such as shops easier than ever. If you have an economy that is currently not supported and you would like the CustomGUI team to add support for that economy plugin, we are more than willing to do so if we can be provided with a copy of the plugin, and it has an API in place. Below are the valid balance type identifiers that can be set for each item in the "BalanceType" section. While there is a custom messages.yml file where you can change each message you may need a specific one for a certain item or GUI. CustomGUI allows you to define specific custom messages for individual items. Below are examples of custom messages being implemented. # or anything like that i'm always open to new ideas. # Thank you for supporting this project! # in this configuration file. # clicks again before the player click delay has expired. # an item slot is provided. If set as false it will not override items. # any GUI's in-game this section will automatically be created. # explanation of how to create a GUI be sure to check out the plugin page. # <Item Type> | The item type specific item to display in the GUI. More info can be found on the plugin page. # ClickCost: - <value> | The required amount of currency to use the item. # XPLevelClickCost: - <value> | The required amount of levels to use the item. # want anything to be sent to the player.